The last few decades have seen numerous studies undertaken to identify the possible outcomes of CLIL in Europe and other countries. However, no such research has been conducted in Japanese primary schools. This Japanese study compares a CLIL class of 35 students and a conventional EFL class of 36 students. The students in the two classes studied a common theme. An analysis is made of the outcomes obtained in both classes. These outcomes are triangulated with data from lesson observations and student responses to a questionnaire with closed and open-ended questions. The present study provides empirical data on teaching and learning through CLIL and is an exploratory report on the potential of CLIL for primary EFL education in Japan. CLIL originated in Europe in the 1990’s. It aimed to help students develop increased proficiency in one or more languages in addition to their first language. As such, CLIL proved to be a promising educational approach which integrates learning content along with a foreign language (Mehisto et al., 2008; Coyle et al., 2010; Ikeda, 2011a). CLIL has proliferated in Europe and numerous studies have been undertaken from macro-level to micro-level in order to investigate the outcomes of CLIL (Dalton-Puffer et al., 2010; 8-11). In addition, frameworks that seek to articulate CLIL practices have been defined, one of which is the 4Cs principle of CLIL: Content (subject matter), Communication (language learning and using), Cognition (learning and thinking processes) and Culture (the realisation of global citizenship with intercultural understanding) (Coyle, 2007: 550; Coyle et al., 2010: 41). Primary schools in Europe report that CLIL is an effective tool in supporting pupils in improving their proficiency in the target language (Serra, 2007; Craen et al., 2008; Hüter and Rieder-Bünemann, 2010). Gonzalez (2011) argues that CLIL fosters a positive attitude toward the target language and motivates students to learn it, which is precisely what Japanese English education aims to achieve. Following the formal introduction of EFL (English as a Foreign Language) classes at Japanese primary schools in April 2011, a need to determine effective strategies for language education arose. In this context, it seems crucial to investigate whether the positive outcomes of CLIL implementation could have implications for EFL primary-level education in Japan. To date, no study has investigated both CLIL and regular EFL classes in Japanese primary schools. As of 2013, all fifth and sixth grade students (10-12-year-olds) in Japan receive English classes once a week for a total of 70 classes over two years. The primary purpose of this education is ‘to form the foundation of pupils’ communication abilities through foreign languages’ (Ministry of Education, Culture, Sports, Science and Technology, henceforward, MEXT, 2009: 1). More precisely, the introduction on this form of English language instruction has three aims: 1) ‘developing an understanding of languages and cultures through various experiences’, 2) ‘fostering a positive attitude toward communication’ and 3) ‘familiarizing pupils with the sounds and basic expressions of foreign languages’ (MEXT, 2009: 1). Regarding ‘various experiences’, Butler (2005) and Yoshida (2011) recommend that teachers provide students with experiential learning by maintaining a good balance between the level of the students’ cognition and their English competency. In particular, Butler (2005) claims that lowering the cognitive level of the activities or materials for the students should be avoided no matter how narrowly limited their English is. Furthermore, in order to realise these objectives, MEXT suggests teachers link their lessons with that of other subjects while concomitantly considering students’ interests (MEXT, 2009). In short, these objectives underline the value of communication, various types of experiential study (cognition), culture/community, and content which are all principles favoured by the CLIL approach (Coyle, 2007: 550; Mehisto et al., 2008: 31; Coyle et al., 2010: 41). Two experimental classes, a CLIL class and a non-CLIL (standard) EFL class were conducted simultaneously to identify differences between the two by analysing lesson observations and student questionnaire responses. 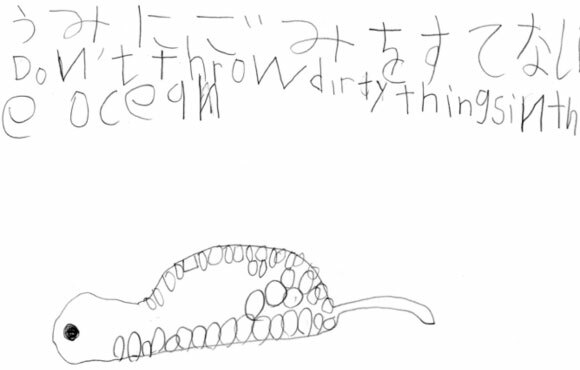 This experiment involved 71 fifth graders (11-year-olds) in a Japanese primary school. The students had just started learning English six weeks prior to the research class. In other words, they were absolute beginners in English. Two classes of this grade were organised at the beginning of the school year with due consideration to two matters: 1) student achievement in each subject and 2) the homeroom teacher specialty. In this study, one class (n =36, 20 boys and 16 girls) was assigned to non-CLIL lessons, a conventional English class, where the target language was taught as the main focus. The other class was a CLIL class (n =35, 20 boys and 15 girls), in which English was used as a medium for a thematic lesson along with several other subjects. It should be noted that the division of students into CLIL and non-CLIL classes was not influenced by elitism, which is one of the controversial issues in current CLIL comparative studies (Dalton-Puffer et al., 2010: 282). On the contrary, due to the CLIL class homeroom teacher’s specialty, special needs education, the proportion of students with learning difficulties, such as Learning Disability (LD) or Attention Deficit Hyperactivity Disorder (ADHD) was 14.3 per cent as compared to 8 per cent in the non-CLIL class. It is not unusual, however, to have students with learning difficulties in a regular class at public primary schools in Japan. The average ratio of children who have learning difficulties amongst those of school-age is 6.5 per cent (MEXT, 2012). Nevertheless, the number of the students with learning difficulties in the CLIL class was relatively high, which concerned all the teachers in this school including the CLIL homeroom teacher who felt the CLIL class was one of the most difficult classes to deal with. Three prototypical types of teachers were involved in this study: a native English-speaking teacher (NTE), a Japanese teacher of English (JTE, the researcher undertaking this study), and two homeroom teachers, each in charge of their own class. The CLIL and non-CLIL classes were conducted by the NTE and JTE through team-teaching with the support of each homeroom teacher. In this study, two different types of data were collected: a recording of the lessons and pupils’ responses to a questionnaire based on the Likert-scale items and open-ended questions. For the first, audio-video equipment was employed to record classroom interaction and students’ reactions during the lessons. The data was transcribed afterward. Then, at the end of each lesson, a student questionnaire based on a Likert scale and two open-ended questions were administrated. The former was intended to obtain students’ overall reflection on their lessons in terms of comprehension of the content and language, perceived difficulty of the class, and the level of satisfaction the students felt during the class. The open-ended questions were answered voluntarily by the students, which aimed to procure their individual and detailed impressions about the lessons. All the data were utilised to elucidate the difference between CLIL and non-CLIL (standard) instruction, as well as to obtain detailed information from the students’ perspective on the lessons. Three 45-minute research lessons were designated for both the CLIL and non-CLIL classes on the 2nd, 9th and 16th of June, 2011. The topic chosen for this study was ‘animals’, based on a needs analysis conducted on both students and homeroom teachers. The lessons aimed at a) learning the target language vocabulary (i.e. the names of colours, animals and their habitats in English), b) communicating in English by using interrogative questions, such as ‘What is this?’, ‘What animal do you like?’ or ‘What animals live in the ocean?’. In the non-CLIL class, English was taught as the main focus of the lessons bearing in mind the objectives of Japanese primary school English education, for instance, teaching pronunciation or different expressions of animal cries in order to understand the differences in language and culture, or providing students with many enjoyable activities (e.g. games or interviews which involved asking other students about their favourite colours or animals) to familiarise them with the target vocabulary while fostering a positive attitude toward communication. In the CLIL class, all the lessons were taught by incorporating core principles of CLIL. Content incorporated art and craft skills as well as science and social studies. In the first class, the students crafted their favourite animals with coloured clay while using the vocabulary of the colours and animals in English. At the beginning of the second lesson, which was related to science as well as arts and crafts, the students first learned about animal habitats in English by categorising the animals they had crafted in the previous lesson and then making a class zoo by using coloured clay again. 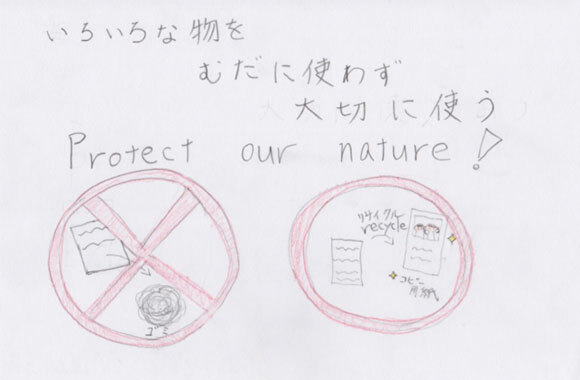 The third lesson was a social study class wherein the students gained awareness about problems facing endangered animals and then proposed solutions to save the animals. As for Communication, since CLIL acknowledges the importance of three different types of expressions (Coyle et al., 2010: 36), this study also incorporated these types. First, the ‘language of learning’ (language required to learn the main concepts of the content) was about ‘animals,’ the same as in the non-CLIL lessons. Second, the ‘language for learning’ (language required to participate in classroom operations) also entailed similar phrases to those used in the non-CLIL class, such as interrogative questions. Lastly, the emergence of ‘language through learning’ (unplanned language to teach, which emerges when CLIL students or teachers are actively involved in the class by perceiving the need to express their thoughts or knowledge) was promoted. This parallels one of the objectives of Japanese EFL education: the encouragement of positive communication in class. As regards to Cognition, considering that the students were absolute beginners in English, each lesson involved some tasks or activities entailing lower-order thinking skills (LOTS), which refer to three cognitive process dimensions: remembering, understanding, and applying (Coyle et al., 2010: 30; Ikeda, 2011a: 8). Without memorising or understanding English words, students cannot proceed and engage in the tasks intending to incorporate target language and higher-order thinking skills (HOTS) of analysing, evaluating and creating (Coyle et al., 2010: 30; Ikeda, 2011a: 8). In this regard, the third CLIL lesson was the most challenging for the students, since it demanded their HOTS to brainstorm solutions to save endangered animals and to respond in English. In other words, the lesson involved ‘creation’, which is posited as the highest skill in the revised version of Bloom’s taxonomy (Anderson and Krathwohl, 2001: 31). The Community of the students was expanded from individual output in the first lesson to classroom discussion about world animals in the third lesson. In addition, the main task in the second lesson entailed cooperative learning. Under Culture, the understanding of international matters, learning about endangered animals was expected to raise the pupils’ awareness of wider transcultural global issues. In the non-CLIL class, all lessons were conducted using the traditional Presentation, Practice and Production (PPP) procedure. For instance, in the presentation phase, the teachers provided input by using picture cards or enacting skits in order to facilitate comprehension of the target language, in this case new English words. In the second phase, the NTE articulated the target vocabulary and had the students repeat the words. Rhymes and songs were also chanted to memorise new words and the teachers encouraged students to use the learned vocabulary by asking questions with the use of animal and colour flash cards. In other words, the non-CLIL students had opportunities for explicit practice to understand the target vocabulary. During the last phase, Production, students participated in playing games while using the newly learned English words in an engaging learning environment. The CLIL lessons were carried out in line with the ‘new PPP procedure’ (Ikeda, 2011b: 21), which refers to Presentation/Input, Processing, and Production/Output. In the Presentation phase, one apparent difference between CLIL and non-CLIL instruction was that the students had a clear goal since they would need to use the target vocabulary, the names of colours and animals, to procure the coloured clay in order to craft their chosen favourite animal. Consequently, the CLIL students participated far more actively in the first phase than was the case with non-CLIL students. A more obvious distinction was revealed in the Processing phase, which refers to a situation where CLIL students use the target language while having an additional content-related cognitive load imposed on them (Ikeda, 2011b: 24). For instance, in the first lesson, as the clay was limited to five colours (red, blue, yellow, white, black), a large number of the students had to synthesise simultaneously their existing knowledge about the mixture of colours with the newly learned English vocabulary in order to create their necessary colour, such as green or purple, for their animals. This aptly embodies ‘[l]earn as you use, and use as you learn’ (Coyle et al., 2010: 10). In the CLIL class, the second phase, Processing, therefore differs from the explicit ‘practice’ in which non-CLIL students engaged. In the final Production phase, the CLIL students worked individually or within a group, employing the learned language as well as HOTS (i.e. comparing, finding, producing) while positively participating in teacher-student and student-student interactions to express their individual thoughts and feelings in English in order to create their own products. 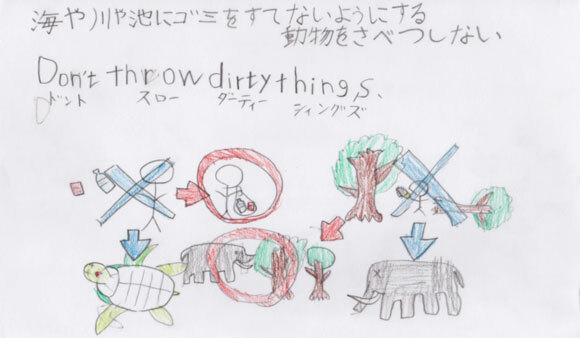 Figure 1, 2, 3 and 4 below are works created by CLIL students who reflected on ways of saving endangered animals. The fourth figure was written by one of the students with learning difficulties. This type of ‘production’ was vastly different from the one in which the non-CLIL students engaged, in that the non-CLIL students simply reproduced the learned language by only using their LOTS (i.e. remembering, memorising) during games, which are typical activities utilised to promote student positive participation in the regular EFL class at a Japanese primary school. Closer observation of each phase revealed one more significant difference in terms of ‘language through learning’, which incidentally appears when the students or teachers need to express individual thoughts or knowledge by actively participating in the class (Coyle et al., 2010: 37). In this study, all the ‘language through learning’ was recorded by using three video cameras and eight IC recorders and later transcribed. Figure 5 reveals that no major difference was found between the CLIL and non-CLIL classes during the input phase. In the two phases following input, however, an obvious distinction appeared. Figure 5 reveals that a larger number of words emerged in the processing and production phases in the CLIL class than in the non-CLIL class. Examples of how such language emerged in the CLIL and non-CLIL class respectively are described below. The second CLIL lesson aimed to have the students work in groups to produce a class zoo by grouping the students into five habitats according to the animals created in the previous lesson. One student attempted to create trees for his ‘forest’ group while comparing them with those of the ‘savanna’ group. This led him to realise that there were subtle differences in the green leaves in his ‘forest’ group when compared with those of the ‘savanna’ group. The observation caught the student’s interest motivating him to ask the language teacher how to describe these differences in English. Consequently, the student learned the new expressions, ‘dark’ and ‘light’ green. On the other hand, the only expression of language through learning that appeared from non-CLIL students was when students forgot how to answer the teacher’s questions and recycled simple expressions like ‘yes’ and ‘no’. One of the reasons for the difference may be ascribed to whether they were deeply engaged in learning or whether their learning was superficial. The example from the CLIL class refers to an incident where a student developed a deeper understanding of the subject by ‘engaging in [his/her] own experience and previous knowledge in an interactive process’ (Light et al., 2009: 52). On the other hand, the example from the non-CLIL class refers to a case where students simply engaged in memorising or reproducing the correct use of the learned language, which is called ‘shallow/surface learning’ (Light et al., 2009: 51-53; Ikeda, 2010a: 7). In fact, during the processing and production phases, the CLIL class student used the learned language by applying his/her existing knowledge in order to create individual products, which led the student to realise that he required another set of words and phrases to express his thought. In contrast, the non-CLIL student only engaged in surface learning by practicing and reproducing the learned language. This implies that CLIL may be able to foster deeper learning of language as it provides students with a cognitively engaging and hence more meaningful learning environment than was the case with the non-CLIL language class under study. Greater cognitive engagement creates opportunities to identify new language the students wish to learn – ‘language through learning’ – in order to express their thoughts about the content being explored. A summary of students’ responses to questionnaire items in both the CLIL class and the non-CLIL class are given in Figure 6. All the questions were administered in Japanese and have been translated into English below. Item 1: Did you enjoy the class? Item 2: Did you understand the English used in the lesson? Item 3: Did you understand the content of the lesson? Item 4: Was the lesson difficult for you? (If it was difficult, which was more difficult for you, the English or the content? Item 5: Are you satisfied with the lesson? The students responded by choosing one of the four options and the rating was measured on a scale where ‘4 = yes’, ‘3 = yes, to some extent’, ‘2 =no, to some extent’ and ‘1 = no’. The scores of the data were computed to obtain the mean score. Then, statistical significance between the CLIL and non-CLIL class was calculated for each item by employing t-tests with the use of Minitab 16. These results are reflected in Figure 6 below. Considering that the highest score of the scale items was 4.0, the data indicate that the mean score of the CLIL class was considerably higher in terms of enjoyment of the lesson (item 1), comprehension of the language (item 2), comprehension of the content (item 3) and satisfaction gained from the lesson (item 5). As for the level of difficulty of the lesson, the results of item 4 suggest that the non-CLIL students experienced more difficulty than the CLIL students. There are significant differences between the CLIL and non-CLIL classes, which seem to corroborate the results of the mean score. Similarly, the results for the reasons why the students faced difficulty in the lesson also indicate a clear distinction between the two groups. Most of the non-CLIL students who perceived difficulty explained that it arose due to their incomprehension of English, whereas CLIL students blamed the difficulty on insufficient artistic skills in the creative activity. In fact, in terms of language difficulty, a total of 62 negative responses come from non-CLIL students as opposed to 15 from the CLIL class. Regarding the difficulty of the content, three non-CLIL students stated that their difficulty was due to the lack of comprehension of the content, whilst seven CLIL students reported that their difficulty arose due to inadequate artistic skills during the craft activity. One more important difference can be identified in the relationship between items 2, 3, 4 and 5. The first three reflected the students’ perceived comprehension of the lesson, the last one, a sense of fulfilment from the lesson. The CLIL class results report that even the students who chose a negative response for the former items, responded positively in item 5, affirming that despite perceived difficulties, they still felt a sense of fulfilment from the lesson. In contrast, the non-CLIL students who reported a lack of understanding of the language or content had a strong tendency to respond negatively in terms of fulfilment. Accordingly, the mean score of item 5 was consistently higher for the CLIL class than for the non-CLIL class. 2) Please write your impression about today’s lesson. All the responses were coded into three categories: positive, neutral and negative. Obvious distinctions which appeared among the three categories are described below. There are 81 positive responses expressed by the CLIL students whilst 60 favourable answers come from the non-CLIL class. The CLIL students responded in lengthy sentences, describing and affirming their sense of enjoyment while engaging in productive activities, a sense of accomplishment in group work and their products. In particular, satisfaction derived from the comprehension and awareness of global issues motivated twelve CLIL students to learn English by providing them with an authentic purpose for learning. Given below are two typical examples of their responses. Today’s English class was worthwhile. 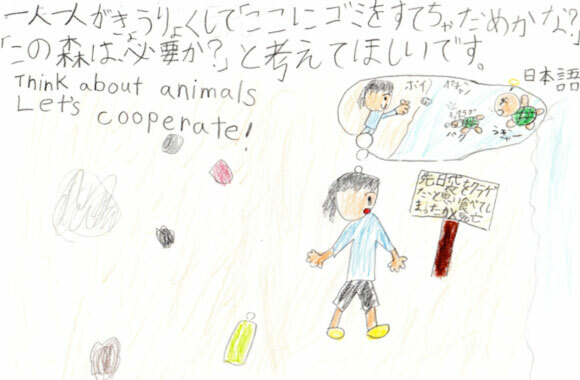 I want to study more English in order to protect wild animals by cooperating with people all over the world. I was glad to learn many things with new English words. I’m looking forward to the next lesson. In contrast, 90 per cent of non-CLIL class wrote brief answers, mostly limited to expressing their enjoyment of the games, such as ‘The game was fun’ or ‘Playing games is always fun’. This category catalogues the vocabulary written in response to the two open-ended questions. Two interesting facts appeared: 1) CLIL students wrote a larger number of English words than did non-CLIL students, 2) the variety of words that CLIL students wrote was twice that of the non-CLIL class, despite the fact that non-CLIL students engaged in explicit practice by focusing on learning of the target vocabulary. Table 1 shows all the words that the students wrote down on the questionnaire. One example that impressed the CLIL teachers came from the word ‘turtle’, which was written by a student who had LD and had abandoned studying all other subjects. The CLIL homeroom teacher reported that ever since she had begun teaching this student, he had never participated in class positively. In the CLIL class, however, he showed his enthusiasm to study the subject content for the first time. He voluntarily wrote the word ‘turtle’ from memory. In fact, the same student chose the highest level on the Likert-scale questionnaire in response to items 1 and 5: ‘enjoyment’ and ‘satisfaction’. Although these results are not sufficient to prove that CLIL enhanced the students’ language learning more than what would have occurred in the non-CLIL class, the results of the students’ open-ended questions suggest that the CLIL lessons greatly encouraged the students’ positive engagement in the class, which may have contributed to their greater recall of vocabulary. This comment is typical of seven other CLIL students’ responses. Thus, although the aforementioned responses from non-CLIL and CLIL classes are concurrently coded as negative, the answers revealed a notable difference in terms of comprehension of the target language and the lesson content. All in all, the results from the quantitative data indicate that the CLIL students perceived the lessons in a more positive light than the non-CLIL students. Furthermore, the responses to the open-ended questions suggest that the CLIL students understood the underlying moral of the lessons as they had both an emotional and an analytic response to each lesson, which in turn may have promoted recall of the target vocabulary. The integration of content and language learning captured the students’ interest and led them to engage in meaningful experiential learning in a cognitively demanding environment more so than was the case among non-CLIL students. This may have accelerated vocabulary learning among CLIL students. Communication, especially in the form of new expressions of ‘language through learning’, emerged in the CLIL class, which seemed to point towards active student and teacher participation. In other words, CLIL has the potential to foster a positive attitude in students, even those with learning difficulties, toward the target language. The understanding of international matters helped to raise the students’ awareness of a global issue, and engaged them in proposing ways of addressing the issue. Furthermore, it seemed to motivate them to communicate in English, which in itself may give them a strong reason to study the target language. This article thus argues that CLIL can foster the use of the above pedagogical notions, and contribute to increased student engagement and learning of content and language from the very onset of a CLIL course. Anderson, L. W. and Krathwohl, D. R. (eds): 2001, A Taxonomy for Learning, Teaching, and Assessing: A Revision of Bloom’s Taxonomy of Educational Objectives. Longman, New York. Baetens Beardsmore, H. B.: 2008, Language promotion by European supra-national institutions, in O. García (ed. ), Bilingual Education in the 21st Century: A Global Perspective, (197-2š17). Wiley-Blackwell, Chichester. Butler, G. Y.: 2005, English Landuage Education in Japanese Elementary Schools: Analyses and Suggestions Based on East Asian Perspectives. Sanseidou, Tokyo. Coyle, D.: 2007, Content and language integrated learning: Towards a connected research agenda for CLIL pedagogies, The International Journal of Bilingual Education and Bilingualism 10, 543-562. Coyle, D., Hood, P. and Marsh, D.: 2010, CLIL: Content and Language Integrated Learning. Cambridge University Press, Cambridge. Craen, P., Ceuleers, E., Mondt K and Allain, L.: 2008, European multilingual language policies in Belgium and policy-driven research’, in K. Lauridsen and D. Toudic (eds. ), Language at Work in Europe, Festschrift , (139-151). V&R Press, Göttingen. Dalton-Puffer, C., Nikula, T. and Smit, U.: 2010, Charting policies, premises and research on Content and Language Integrated Learning, in C. Dalton-Puffer, T. Nikula and U. Smit (eds. ), Language Use and Language Learning in CLIL Classrooms, (1-19). John Benjamins, Amsterdam. González, A. V.: 2011, Implementing CLIL in the primary classroom: Results and future challenges, in C. E. Urmeneta, N. Evnitskaya, E. Moore and A. Patino (eds. ), AICLE-CLIL-EMILE Educacio Plurilingue: Experiencias, Research & Politiques, (151-158). Universitat Autónoma de Barcelona, Barcelona. Hüter, J. and Rieder-Bünemann, A.: 2010, A cross-sectional analysis of oral narratives by children with CLIL and non-CLIL instruction, in C. Dalton-Puffer, T. Nikula and U. Smit (eds. ), Language Use and Language Learning in CLIL Classrooms, (61-80). John Benjamins, Amsterdam. Ikeda, M.: 2011a, The basic Principles of CLIL, in Watanabe, Y., Ikeda, M. and Izumi, S. (eds. ), CLIL (Content and Language Integrated Learning): New Challenges in Foreign Language Education at Sophia University, Volume 1: Principles and Methodologies,(1-12). Sophia University Press, Tokyo. Ikeda, M.: 2011b, The syllabus and materials of CLIL, in Watanabe, Y., Ikeda, M. and Izumi, S., CLIL (Content and Language Integrated Learning): New Challenges in Foreign Language Education at Sophia University, Volume 1: Principles and Methodologies, (15-29). Sophia University Press, Tokyo. Light, G., Cox, R. and Calkins, S.: 2009, Learning and Teaching in Higher Education: The Reflective Professional. Sage Publishing, London. Mehisto, P., Marsh, D. and Frigols, M.: 2008, Uncovering CLIL: Content and Language Integrated Learning in Bilingual and Multilingual Education. Macmillan, Oxford. MEXT (Ministry of Education, Culture, Sports, Science and Technology): 2012, A survey on the students with learning difficulties who need special education in a regular class. Serra, C.: 2007, Assessing CLIL at primary school: A longitudinal study, International Journal of Bilingual Education and Bilingualism 10, 582-602. Yoshida, K.: 2011, Issues in the transition of English education from elementary schools to secondary schools, in Yoshida, K., A Report on the Research Results about ‘The Influence of Early English Education on the Study of English at Junior High School’: From a Survey Based on Affective and Can-do Factors, (101-112). Sophia Linguistic Institute for International Communication, Tokyo.